An introduction to ethical theory and applied ethics; Professional codes of ethics in the information professions; Ethics and digitisation policies; Ethics in selection of materials to digitise; Ethics and funding; Ethics and digital collaborations; Ethics and digitisation standards; Ethics in the digitisation process; Ethics and digital preservation; Ethics and access; Ethics and digital library management; Ethics for twenty-first century librarians. 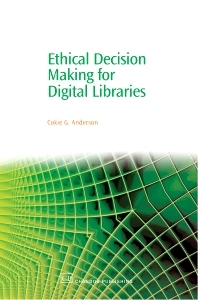 This book examines the ethical issues and dilemmas that arise in digital libraries, and the codes of conduct, professional guidelines and ethics resources used in resolving them. The book begins with an overview of classical and applied ethics, then reviews the codes of conduct of professional information societies (libraries, archivists, information technology). The book then examines issues and situations that arise in digitization and digital library management, and explores the ways established information ethics can be applied and adapted to these cases. Cokie Anderson has been an Assistant Professor at Oklahoma State University since 2000, and directs the University Library’s Electronic Publishing Center. She is one of the founding members of , a collaborative effort by Oklahoma libraries, archives, and museums to digitise cultural materials.